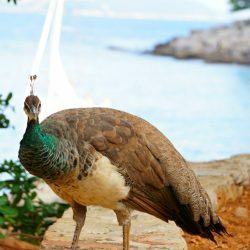 Split and Dubrovnik get much more attention than Zagreb, the capital of Croatia. 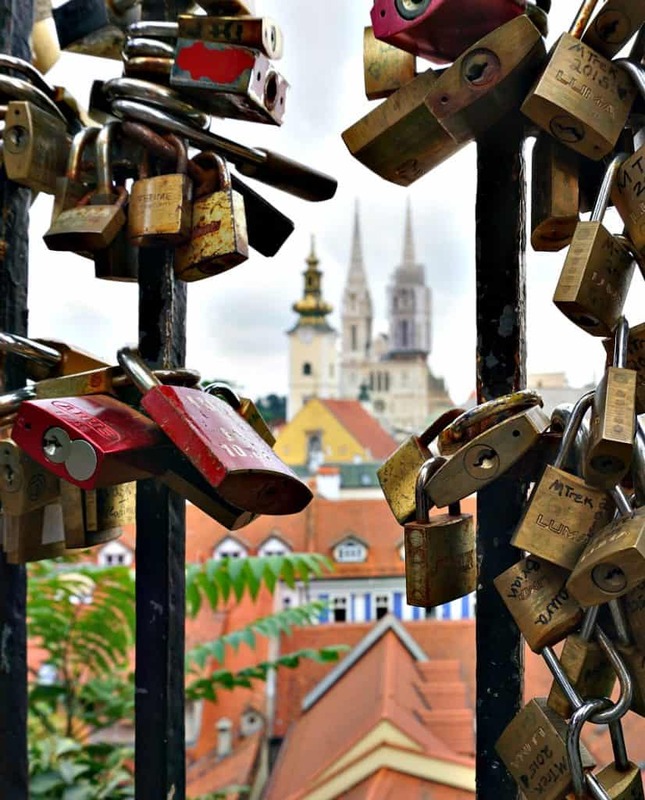 Sure, Zagreb doesn’t have the coast, but this city has a complex history, incredible architecture, some strange museums, and a lively and friendly atmosphere. We spent a week exploring the city, and have outlined our favorite things to see, most of them possible on a single-day walk. 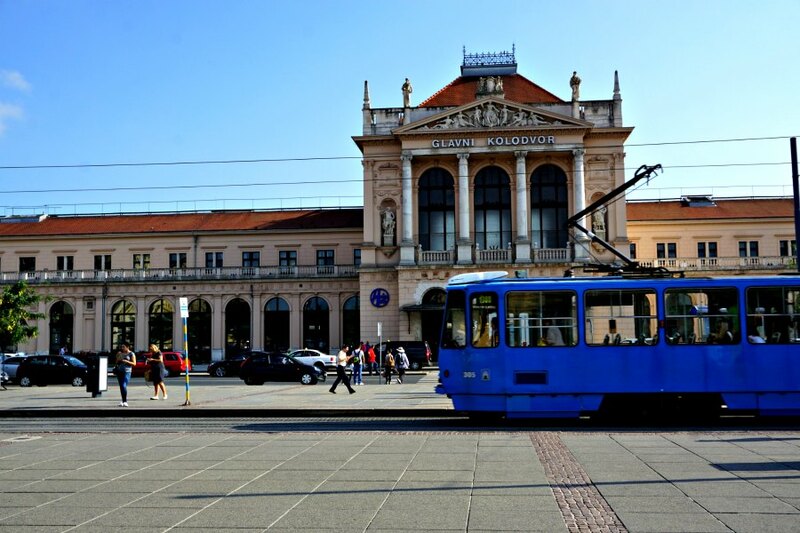 Zagreb’s pretty small and walkable, but if you need to travel a little further, trams are the easiest mode of transportation. You can buy a ticket at any of the tobacco stores dotting the city, or on the tram itself. Don’t forget to stamp your ticket at the machine once on the bus – although most of the locals seem to ignore the machines. On one trip, the only person other than us to use the machine was an elderly nun, who clearly wasn’t going to risk sinning over a 1 Euro tram fare. 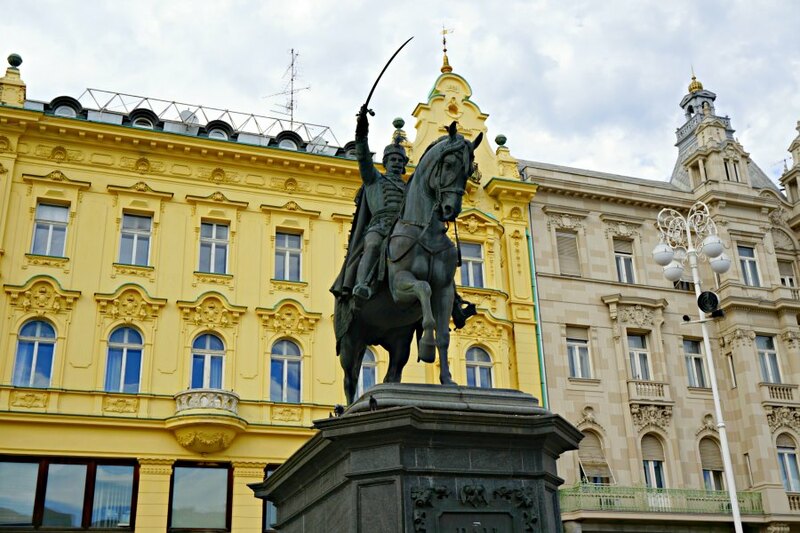 Any wander through Zagreb’s old town starts in Ban Jelačić Square, the main square. 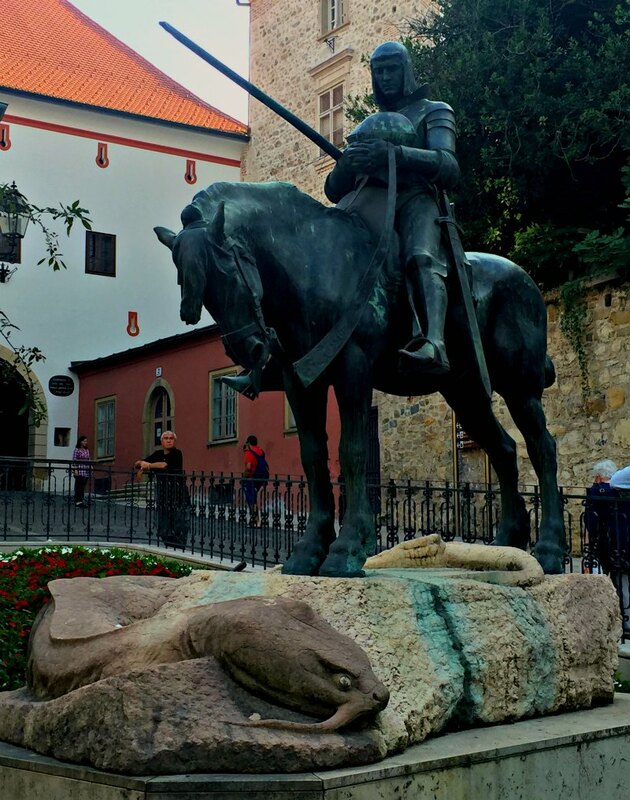 A huge statue of Josip Jelačić on horseback is one of the central features of the square. Jelačić was a military general and leader (“Ban”) of Croatia during the revolutions that swept Europe starting in 1848, and is credited for helping to end feudalism in Croatia. The square is also the meeting place for locals and tourists alike. For locals, it’s standard to call friends and arrange for drinks in the city, saying “Meet you at the clock” – the clock tower. On busy evenings, there can be so many people milling around the clock that its purpose as a meeting place all but useless. Friends who may be just a few meters from each other can’t find each other and resort to calling and texting to describe, exactly, where near the clock they are. 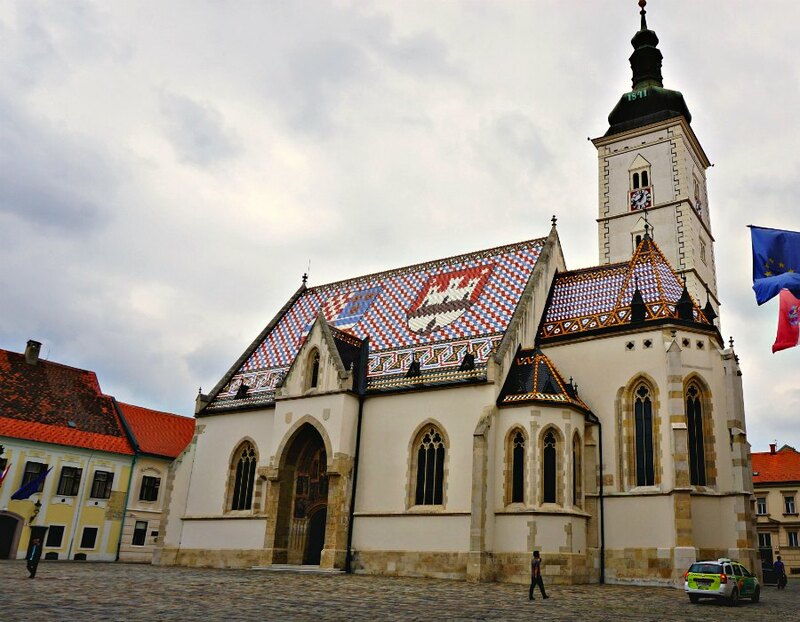 The old town of Zagreb today is actually made up of two original settlements, Kaptol and Gradec. Each was built on one of the hills for defensive purposes. But, here the similarities ended. Kaptol was early on named as the seat of the local bishop, and the town was ruled by a group of canons (from which it derives its name). Essentially, Kaptol was a church-run settlement. Gradec, on the other hand, was a feudal holding that owed its allegiance to the king. Very early arguments of church versus state were often fought violently, with the bridge over the valley between the two settlements the stage for squabbles and battles. While the bridge no longer remains, the alley today connecting Tkalčićeva and Radićeva is called the “Bloody Bridge” in memory. Over time, the settlements grew and merged to become current day Zagreb. Today, the two areas hilltop areas are referred to as “Upper Town” and the lower areas, predictably, “Lower Town”. 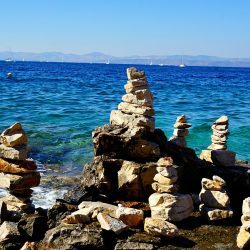 As a city built on hills, there’s plenty of opportunity to work off some Croatian-food calories by hiking up to see the sites in Upper Town. And, the views of the old city make the climb well worth it. 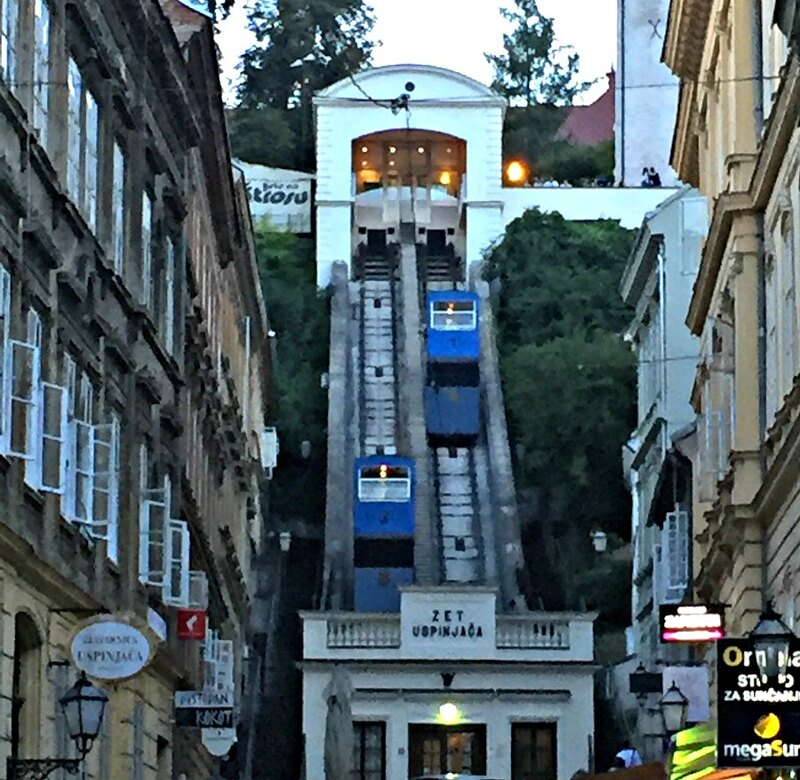 If you want to skip the exercise, though, the funicular will get you to Upper Town. 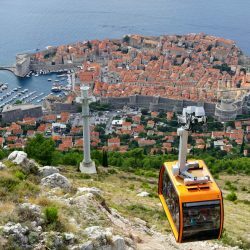 The funicular is actually one shortest public-transport funiculars in the world, with the trip up taking less than a minute. And how did the towns of Gradex and Kaptol become know as Zagreb? You’d think it would be more like Gradtol or Kapdex, right? 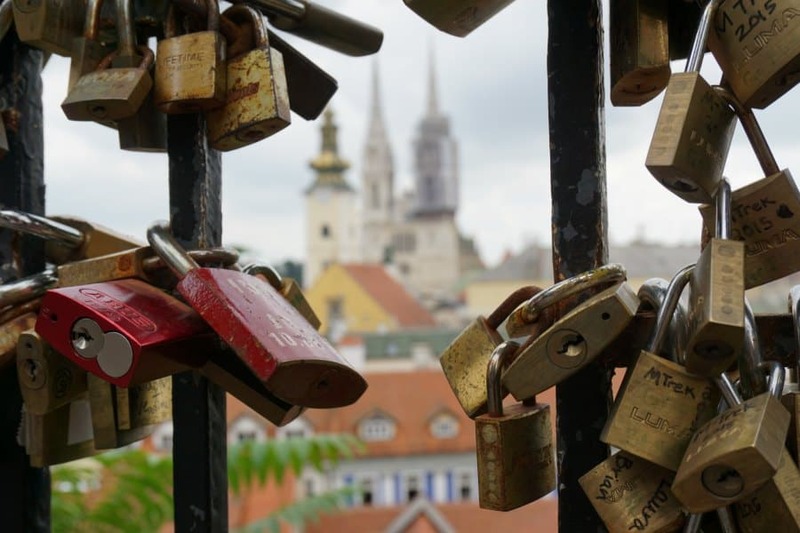 No one really knows the origin of the name Zagreb. It first showed up in documents dating back to 1134. There are lots of legends, though. 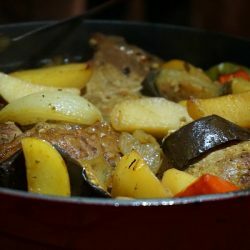 Since the Croatian word “zagrabiti” translates approximately to “to scoop”, this is one of the most popular bases for the legends. One story involves a Croatian leader on a frustrating and thirsty trek with his soldiers through the desert. He drove his sword into the ground and when water poured out, he ordered his soldiers to dig or scoop the dirt away to quench their thirst. Today there is a fountain in Ban Jelačić Square, on the spot where the old Manduševac well was located. 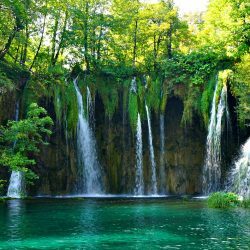 According to another story, many years ago, a thirsty government official ordered a young girl named Manda to fetch him some water from the well, telling her in Croatian “Zagrabi, Mando!” which means, Scoop it up, Manda! 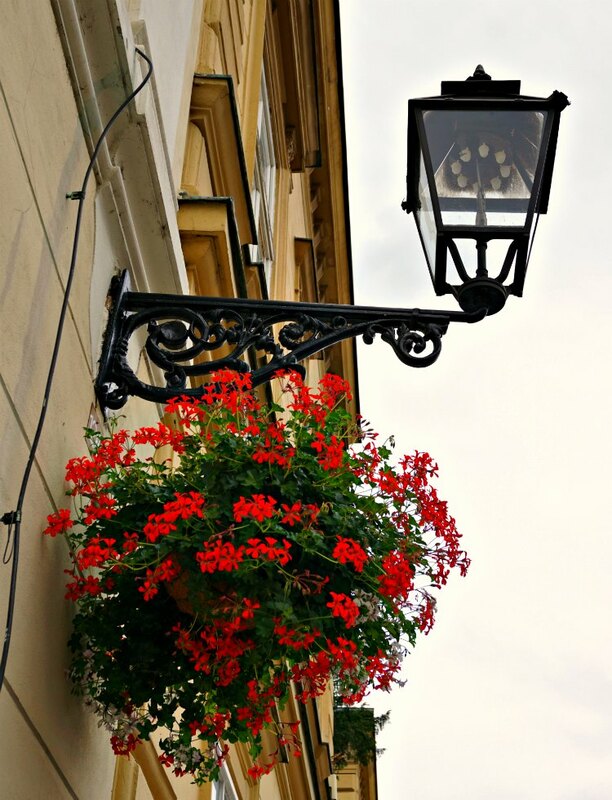 A nice traditional touch that has been preserved in old town Zagreb is the lamp lighting “ceremony”. The hundreds of gas lamps that you’ll see throughout the town (just look up), are still lit and extinguished by hand by a single lamplighter and his apprentice. To catch sight of the lamplighters, just find an unlit lamp before dusk and camp out by it. Eventually a lamplighter will be along with a long stick to get the lamps lit for the evening. But, don’t expect any period costumes reminding you of fashions at the turn of the century. With nearly three hundred lamps to be turned on and off, twice a day, your lamplighter is more likely to be wearing modern running shoes. Everywhere you turn in Zagreb you’ll find art and statues. This is just a small sampling of some of our favorites. Does that really look like a dragon? There have been plenty of depictions of old George and his nemesis, and I understand, without a live model artists have to get creative when imagining the dragon. But this one looks a little more like George and the giant catfish. Not that slaying a catfish isn’t a feat in itself. 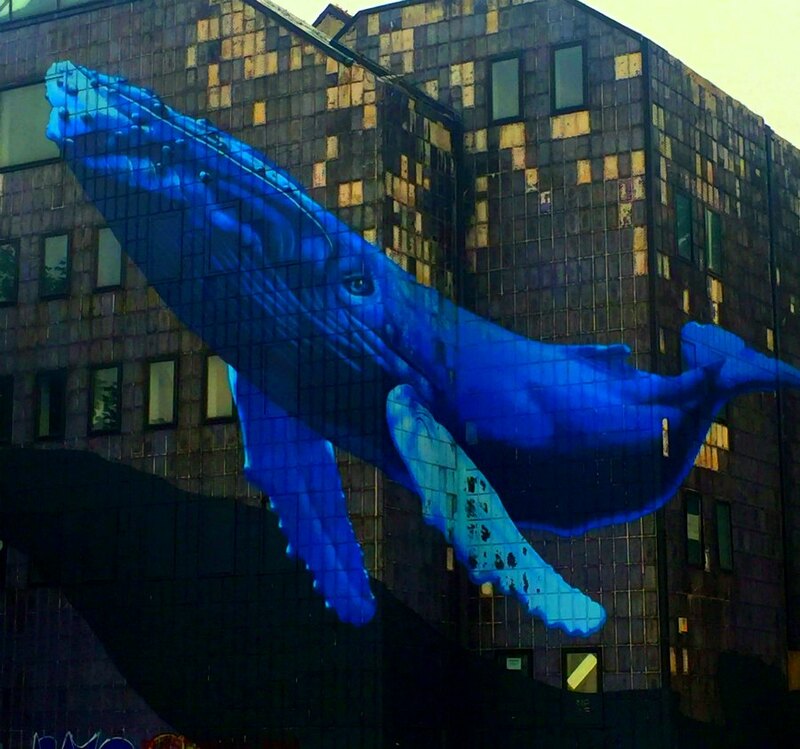 One of the most well known pieces of street painting in Zagreb, this massive mural of a whale seems to be swimming along the side of an abandoned building. Unfortunately, the painting is in need of a little upkeep (like the building on which it sits), but it’s still an impressive sight. Called “Kumica”, this stature depicts peasant woman with woven basket on her head, and fittingly, is located in the Dolac Market. 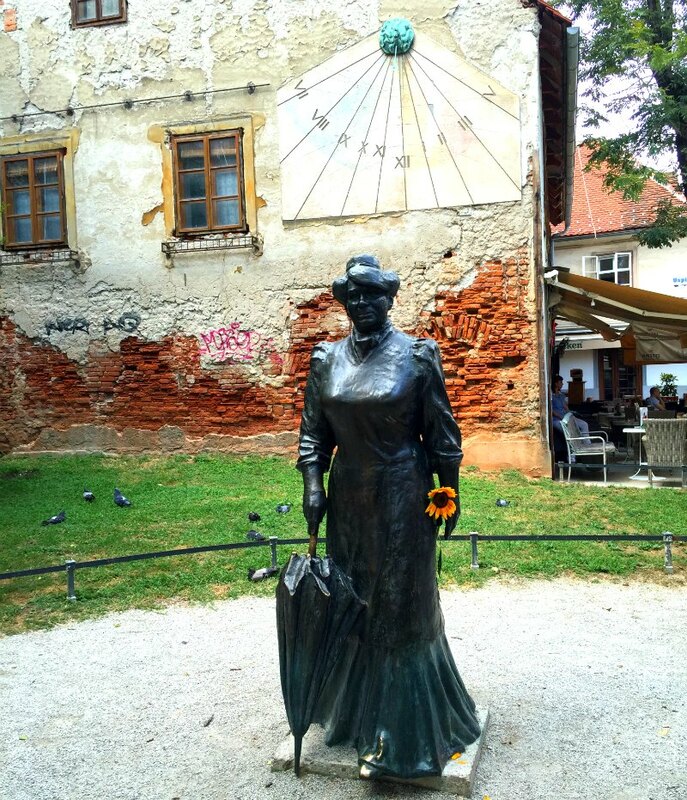 In the busy Tkalciceva area, there is a statue of a woman wearing a high-collared dress and toting an umbrella – a look that doesn’t quite fit in with the young crowd and bars on the street. This is Marija Jurić Zagorka, Croatia’s first female journalist and an accomplished novelist. Unfortunately, none of her books have been translated into English, so we’ll need to do quite a bit of work on our Croatian to read them. 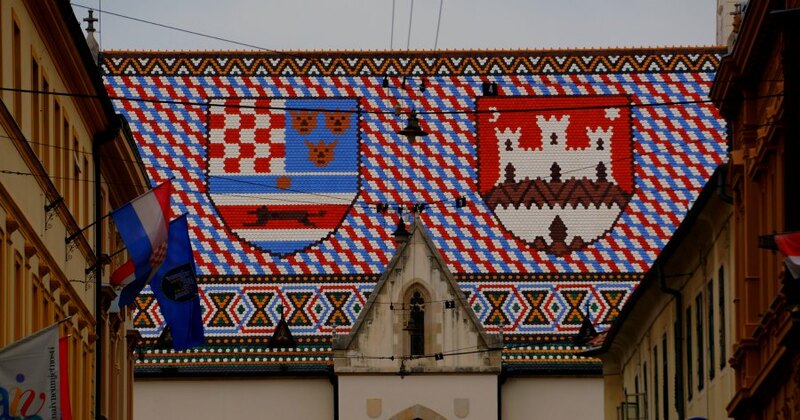 St. Mark’s Church tile roof displays the coat of arms of Zagreb as well as a coat of arms representing Triune Kingdom of Croatia, Slavonia and Dalmatia. The unique tiling reminded me a little of a lego construction rather than a traditional church. On either side of the church are the Parliament building and the city hall. This is also a good spot to think about the more recent struggles in Croatia. Also known in Croatia as the Homeland War, the Croatian War of Independence, which was fought between 1991 and 1995, devastated parts of former Yugoslavia. Although clearly affected, Zagreb was far enough from the fighting to remain mostly untouched from attacks in the city. Zagreb was only bombed three times during the conflict, once in an attack on the residence of the president of Croatia, who was in the building but escaped unharmed. As you face St. Mark’s Church, to the left is the residence that was bombed, now restored and serving as the city hall. If you time your walk right, you can get to experience a daily ritual which occurs at exactly noon each day. Lotrščak Tower is an old fortified tower in the upper town. If you look up to the open window near the top of the tower, you can see the end of a cannon. In a tradition that has its history in letting the churches when to begin tolling their bells, the cannon is still fired every day at noon. It’s just for show, now, and no cannonballs are shot, either. But be prepared, because the blast comes quick, and hang onto your phones/cameras, because the noise is still earth shaking. The other major church in town in the Zagreb Cathedral. The tallest building in the old town (and in fact, the tallest building in all of Croatia), it’s visible from all around old town and serves as a great landmark to keep from getting lost. The cathedral has been destroyed and rebuilt numerous times since its original construction finishing in 1217. First destroyed by Mongols and then rebuilt, the current building is the result of construction following the 1880 Zagreb earthquake. This area is also home to one of the most unique museums we’ve visited. 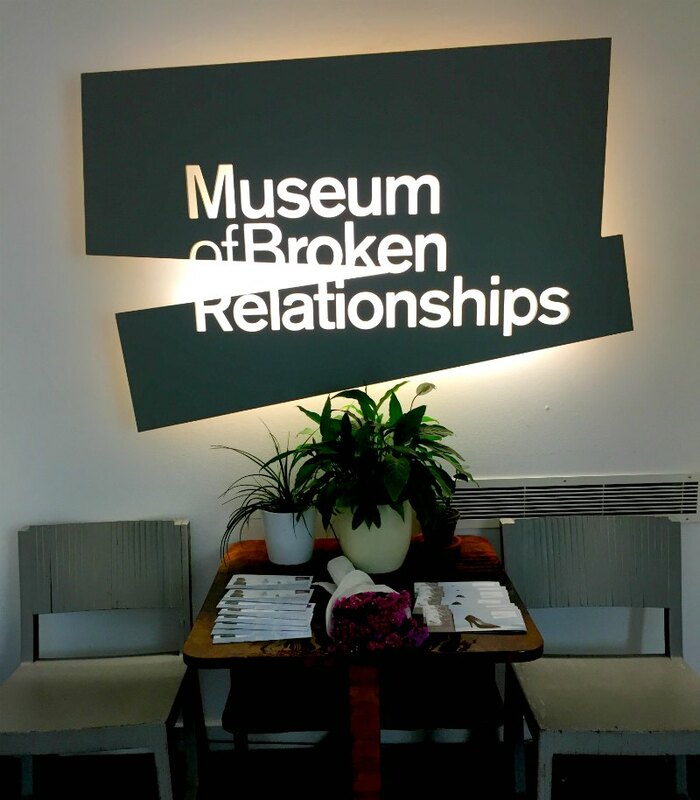 The Museum of Broken Relationships is the brainchild of Olinka Vištica and Dražen Grubišić, a couple of designers who broke up, and were at a loss with what to do with all the items that represented some part of their failed relationship. They formed a traveling exhibition, with their own and many more items donated by people intrigued with the idea. Today the museum has a permanent home, with a rotating series of exhibits that highlight not just broken love relationships but also family relationships as well. The individual items on display run the gamut: from an old garden gnome, to a pickaxe, to a number of tabs of ecstasy. Each item has a written description explaining its significance (or insignificance) to a former relationship. It’s an odd concept, and while it seems a little depressing, it’s more poignant and thought provoking than you’d imagine. And, the museum has been a huge success, putting on exhibitions around the world. It is even opening a second permanent museum on Hollywood Boulevard, perhaps even a more a fitting place, I think. Operating since the 1930’s, the central market bustles with farmers and vendors selling fruit and vegetables. It’s located on the old “border” between upper and lower towns. Along the edges of the market are indoor stalls housing butchers with fresh meat as well as cheese mongers, and of course, a number of stands selling Croatian handicrafts and kitschy tourist souvenirs. It’s a great place to grab fresh fruit, or a jar of locally produced honey. For a longer walk around Zagreb, head from the main square to the Lower Town toward and the Art Pavillon and the botanical gardens. 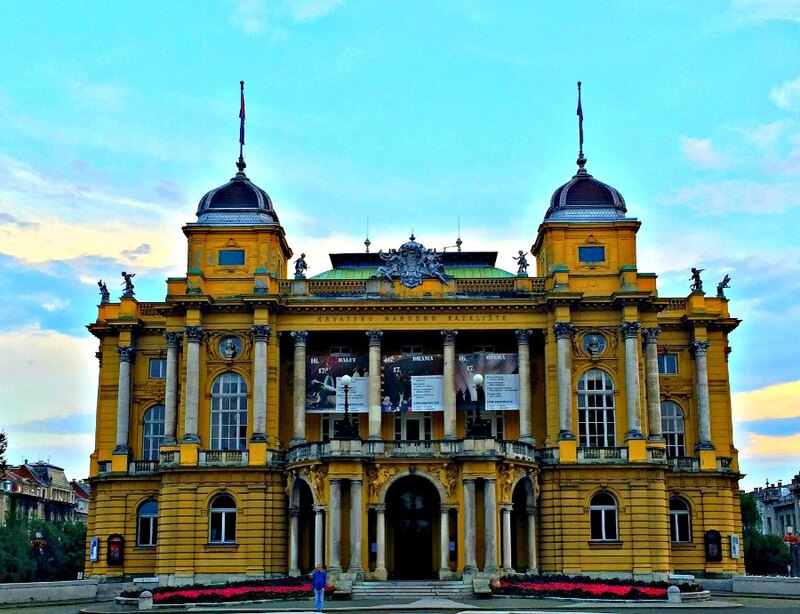 Along the way, you’ll by the brilliantly colored Croatian National Theater. The blocks are connected by parks that allow you to stroll tree-lined walkways and get a calming view of the rest of the city. 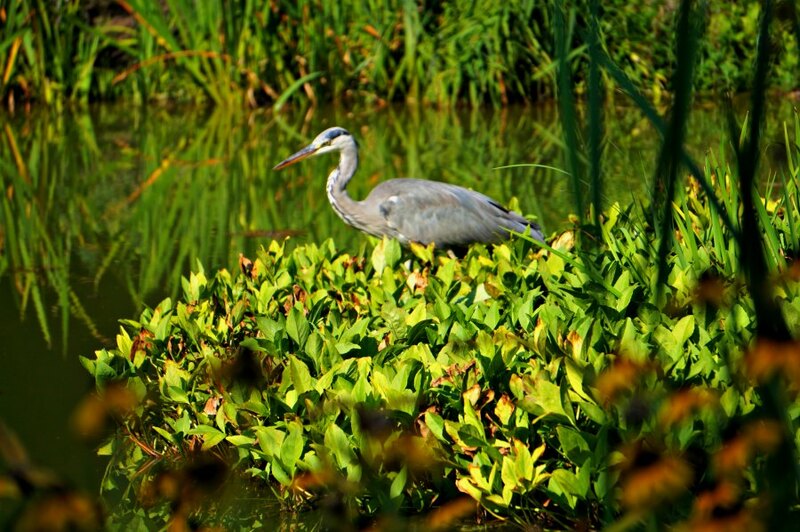 The botanical garden is a great respite from the busy streets and traffic of the rest of Lower Town. 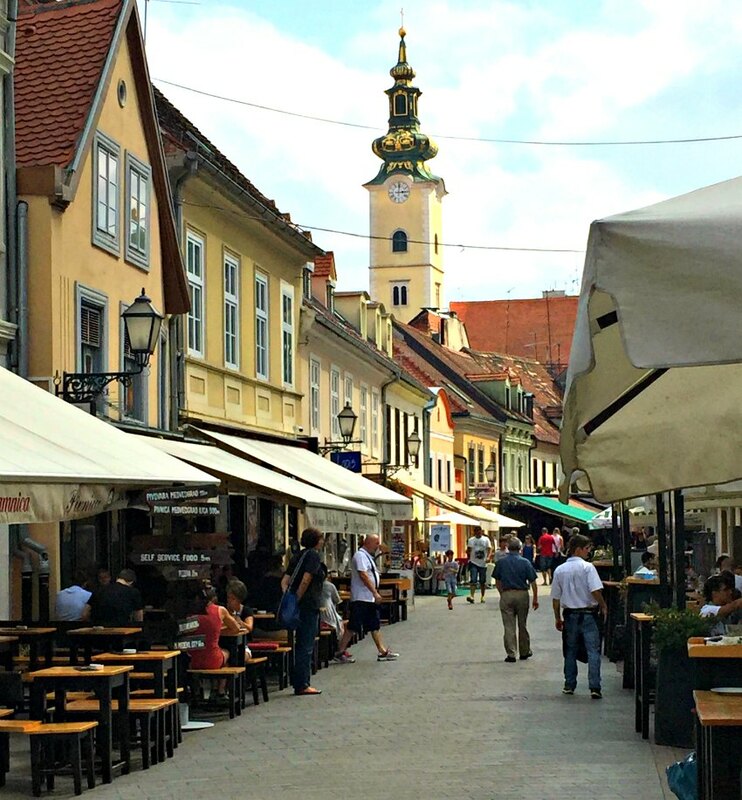 Tkalciceva Street is packed with cafes, bars, and restaurants, and is a perfect place to end a walk through Zagreb. 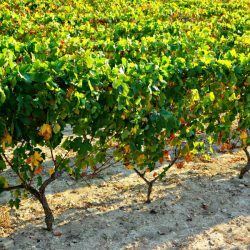 Order a local beer – Ožujsko and Karlovac are the most popular – or sample some of the very good Croatian wine. Croatians are crazy about coffee, and on nice days you can always find the outdoor tables packed with locals enjoying a coffee (and often a cigarette). Toward evening, the coffee gives way to local Croatian beer, and wine. The cigarettes, unfortunately remain. 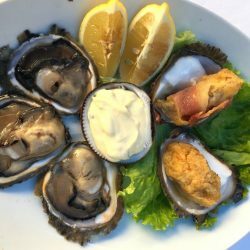 So, find a table on the end, upwind, and sit and enjoy the street life of Zagreb from your perch. 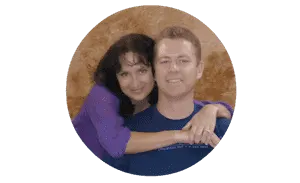 Great post… and thank you for the inspiration. I’m currently spending a month in Zagreb, and I’ve been pondering where to go this weekend – I think into the city might be a good idea. I usually head up into the hills, so a stomp around the city would make a nice change! By the way, that’s totally a dragon… or to be more precise, a wyrm. Check out some European fairy tales, and you’ll see that they don’t all look like Ljubljana’s ones! Or Disney dragons! Ha ha! Regarding Domovinski Rat – when we were living in Rijeka last year (we’re returning to our apartment there in a couple of weeks’ time), we went out for a drive one day, and came to a tiny village called PrimiÅ¡lje. It was heartbreaking. Just before the war, almost 500 people lived there, now there’s about nine (I think). The surrounding fields are still cordoned off with tape which warns of landmines, and almost all of the buildings bear the scars of mass-shooting. There are several memorials on the sides of the roads too, where people have been killed. I took a few photos, with the intention of writing about it but almost a year later, I still cannot bring myself to do so. It’s just too emotionally-charged. I think it’s easy to be ambivalent about wars which occurred outside one’s own lifetime but when faced with the aftermath of something that happened only a few years ago, and where there’s so much evidence of brutality, it’s incredibly unsettling. And it really brings home how lucky you are to have been raised in a country which has not seen a war fought on its shores for centuries. 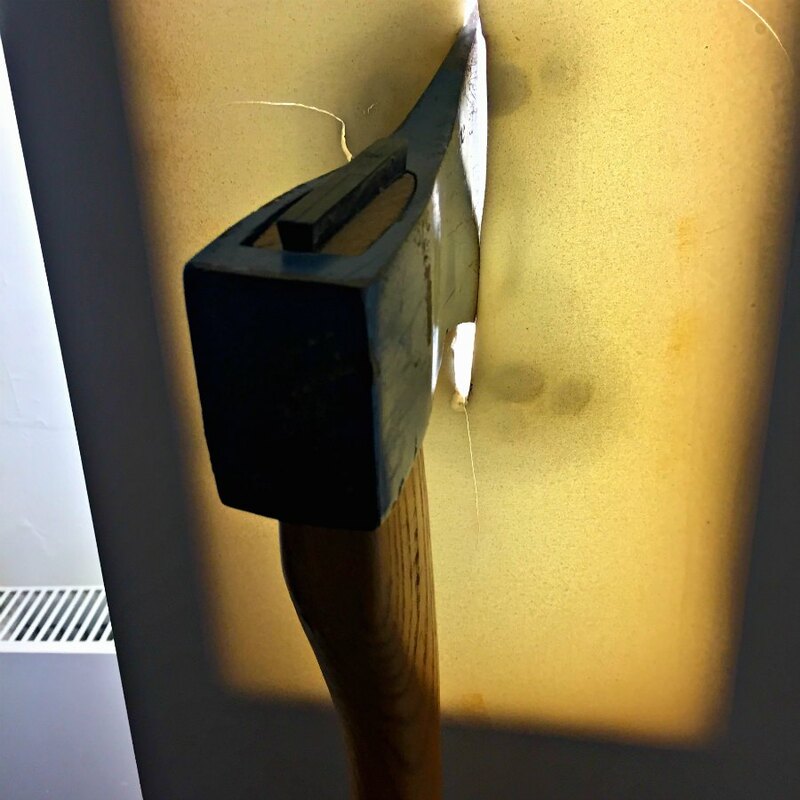 You may be interested in this post I wrote last year – not about PrimiÅ¡lje but about the homeland war in general.